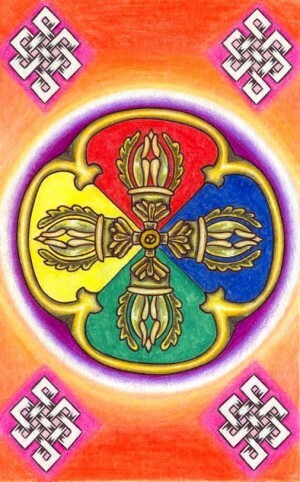 “Double Dorje” offered by Robert Page, a Liberation Prison Project student who served a ten-year prison sentence and received a free subscription to Mandala during that time. Robert passed away in April 2011. I have been receiving Mandala as a gift through my teachers and Dharma friends at the Liberation Prison Project. I want to say that each issue is a joy to read and study, and I thank everyone who contributes to Mandala in any way. My practice has grown through the precious jewel that is Mandala. Current Friends of FPMT are able to give their print copies of Mandala directly to an LPP student. If you would like to do this, please email friends@fpmt.org. In 1996, a young Mexican-American ex-gangster serving three life sentences at a California maximum-security prison wrote a letter to Mandala magazine. He had read Introduction to Tantra (Wisdom Publications), a book by Lama Yeshe, and was moved by Lama’s talk about compassion. He wrote to Mandala, part of FPMT International Office, wanting to learn more. Ven. Robina Courtin, at that time editor of Mandala, responded to the young man’s request and sent him some books and copies of Mandala. From this letter the Liberation Prison Project (LPP) was born, and since 1996, LPP has helped thousands of prisoners around the world study Buddha’s teachings and develop a sincere practice of Buddhism. Over the years, LPP has offered hundreds of free subscriptions of Mandala to prisoners. In 2009, a kind benefactor offered 500 subscriptions for three years. From 2010 to 2012, LPP and Mandala have been able to offer free subscriptions due to an International Merit Box grant. However, these funds no longer cover all of our LPP subscriptions and many more devoted prisoners would like to receive Mandala in order to stay connected to the FPMT organization and its authentic teachings, qualified teachers and international news. The November-December 1997 issue of Mandala features stories from several prisoners (some on the United State’s death row) and how they integrated Buddhist teachings into their lives. Their insights reveal as much about life outside of prison as inside. In this interview, Liberation Prison Project founder Ven. Robina Courtin gives some clear definitions of fundamental Buddhist concepts and discusses some intersections between Buddhist thought and prison work. Read the story of the Mandala Magazine for Prisoners Fund logo. Lama Zopa Rinpoche writes to Liberation Prison Project student P513, congratulating him on successful intensive practice. An overview of Liberation Prison Project activities run by FPMT centers in Italy, Mexico and New Zealand as well as an essay by LPP student Mario Easevoli.